This Banana relative is found growing in Asia from India to Papua New Guinea. 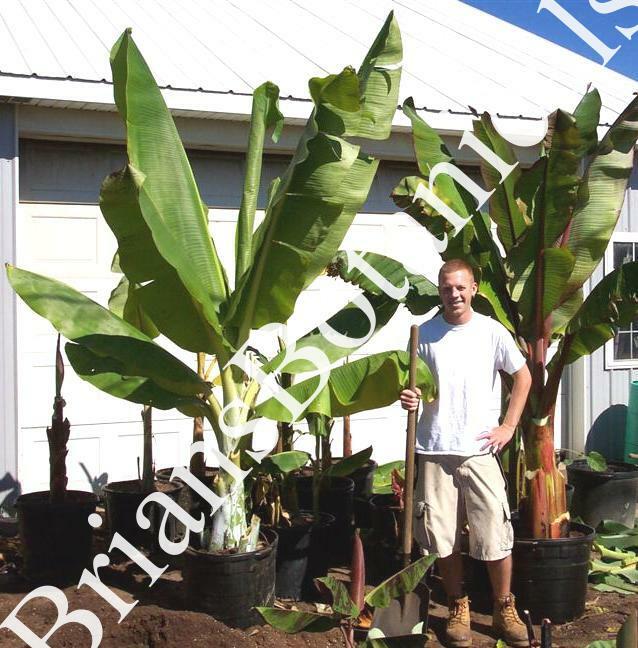 Commonly called the Snow Banana Ensete glaucum can with stand some cold temps and has be reported to over winter in zone 8 and zone 7b if protected. Ensete glaucum has a blue green color to the trunk and foliage the leaves are held at the top similar to most Musa species. The base is usually more swollen at the bottom and can be 1 to 2 feet wide. The flowers are very large and showy usually green and 1 foot wide and several feet long a spectacular sight when in flowering. Seldom offered and a great plant for subtropical and tropical garden. Should also do great as a large potted plant. 7b-10 Plants have survived zone 6 with heavy mulching. It all depends on if they get rot in the crown or center of the plant. If not rot they make it out of winter fine. If rot I normally have to cut to the ground to try and save them. Species native to China, Nepal, India, Myanmar (Burma), and Thailand.